Today, the Cato institute is releasing a new study looking at the state-by-state value of welfare for a mother with two children. In the Empire State, a family receiving Temporary Assistance for Needy Families, Medicaid, food stamps, WIC, public housing, utility assistance and free commodities (like milk and cheese) would have a package of benefits worth $38,004, the seventh-highest in the nation. Since these benefits aren’t taxed, someone in New York State would need to earn $21/hour to beat welfare. That is more than starting teachers get — and not because teachers are underpaid. Welfare is slightly more generous in Connecticut, where benefits are worth $38,761; a person leaving welfare for work would have to earn $21.33 per hour to be better off. And in New Jersey, a worker would have to make $20.89 to beat welfare. Nationwide, our study found that the wage-equivalent value of benefits for a mother and two children ranged from a high of $60,590 in Hawaii to a low of $11,150 in Idaho. In 33 states and the District of Columbia, welfare pays more than an $8-an-hour job. In 12 states and DC, the welfare package is more generous than a $15-an-hour job. Of course, not everyone on welfare gets all seven of the benefits in our study. But, for many recipients – particularly the “long-term” dependents – welfare clearly pays substantially more than an entry-level job. It is conceivable that some rank and file Democrats are so ideologically obedient that even after FDR’s disastrous prolongation of the Depression and LBJ’s lost War on Poverty they still believe the purpose of welfare is to help the poor. But by now our rulers must know what they are doing. 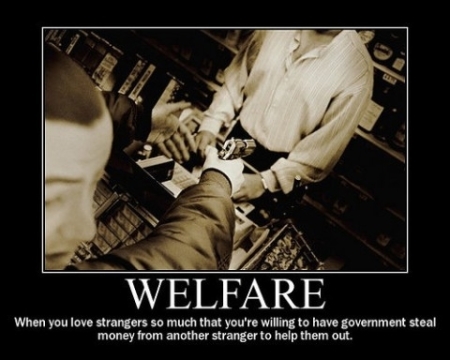 The purpose of welfare is to keep people dependent and relatively poor, so they will continue voting Democrat. An entry level job is the first rung on a ladder socialists would prefer most of us not to climb. The shrinking number who work anyway and are forced to finance the indolence of those who don’t are slaves as surely as an African imported to work a plantation in the days of yore. The welfare state is economically unsustainable and morally intolerable. On a tip from Dr. 9. Cross-posted at Moonbattery.